Patients will find that chiropractic care for hip and knee osteoarthritis can help reduce inflammation, improve joint functioning, reduce pain, and strengthen the muscles around the affected joints. Osteoarthritis in the knee and hip areas can be a very painful injury, and one that is often a chronic condition if left untreated. Chiropractic care for hip osteoarthritis and knee osteoarthritis can be very helpful for patients who have been unable to find relief from the pain in any other way. 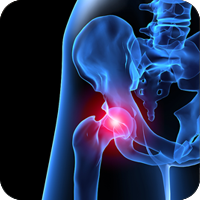 Signs of hip osteoarthritis and knee osteoarthritis include an increasing level of pain in the hip area that may extend into the groin area, pain shooting down the thighs, and pain in the knee joints. It is not uncommon for the knees to be the first place the pain is felt, and some patients may not notice the hip pain until later. The pain often increases when the weather is colder, or when the patient is engaged in physical activity like jogging or walking. Chiropractors use very gentle spinal adjustments to place the spinal column in proper alignment, which has a positive effect on the hip joints that are connected to the spine. While hip and knee osteoarthritis is not curable at this time, it is very much manageable with the help of chiropractic care. Knee osteoarthritis can also be managed very effectively with the help of chiropractic care. The treatments for both knee and hip osteoarthritis may be similar, and can include stretching, massage, gentle manipulation of any painful joints, and the use of ultrasound for healing. "Dr. Sean Feeney has treated me for years. He has always been caring and helpful. He is a great doctor! Thank you"